The Independent Foreign Fiction Prize 2011 has been awarded to Peruvian author Santiago Roncagliolo for his third novel, Red April (Atlantic Books). Roncagliolo beat off competition from a strong shortlist including Nobel Prize-winning Turkish author Orhan Pamuk and former Independent Foreign Fiction Prize winner, Norwegian Per Petterson, to win the Prize. At 36, Roncagliolo is the youngest-ever author, as well as the first from Peru, to win the Prize. The £10,000 award is shared equally with Roncagliolo's American translator, Edith Grossman, who is also a first-time winner. She was previously shortlisted for the Prize in 2003. Commenting on the announcement, Santiago Roncagliolo said, "The Independent Foreign Fiction Prize closes a wonderful 'British season' for me and my book. During the last twelve months I've been to the UK many times to talk at festivals, libraries, bookshops and universities and I am sure that the support of all the people I met during those visits, including my publishers, my agents and my great translator, has been instrumental in my receiving of the Prize. I want to share it with them." 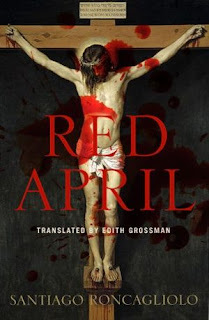 He continues, "Red April is a book with a lot of British influences, from Ian McEwan's The Innocent to Allan Moore's graphic novel From Hell. Maybe that is why British readers have been so generous to me. But I also believe that the British are looking back to Latin American writers – many of my friends and colleagues from Argentina, Venezuela and Colombia have also been listed for the Prize. I am very happy to have won, but I was already honoured to be on the longlist, to be considered in the same league as such amazing writers. I guess this is a Prize for all of us!" Edith Grossman said, "I am thrilled that this wonderful novel by a young writer has won so prestigious a Prize and I am grateful to the judges for their decision. Translating the work of a fine writer is sheer pleasure: the better the writing, the more satisfying the challenge for the translator. This is why I so enjoyed the opportunity to bring the work of Santiago over into English. His use of language is clean and sharp and perceptive, and regardless of the kind of piece he has written, that wonderful quality is constant." She continues "It is immensely exciting to me to find this kind of skill and profound perception in a young writer like Santiago. He has the talent, the skill, and the inborn experience of an old master. I always look forward to translating his work." The winner was announced this evening by Boyd Tonkin, a member of the judging panel since 2001, at a ceremony at the Royal Institute of British Architects in central London. The Independent Foreign Fiction Prize is awarded annually to the best work of contemporary fiction in translation. The Prize celebrates an exceptional work of fiction by a living author which has been translated into English from any other language and published in the United Kingdom in 2010. The Prize uniquely acknowledges both the writer and the translator equally, recognising the importance of the translator in their ability to bridge the gap between languages and cultures. The Independent Foreign Fiction Prize ran previously between 1990 and 1995 and was revived with the support of Arts Council England in 2001. The £10,000 prize money and associated costs are funded by Arts Council England. The Prize is also supported by the Independent and Champagne Taittinger and managed by Booktrust. Previous winners of the Prize include Milan Kundera in 1991 for Immortality translated by Peter Kussi; W.G. Sebald and translator Anthea Bell in 2002 for Austerlitz, and Paul Verhaegan (who translated his own work) for Omega Minor in 2008. The 2010 winner was Brodeck's Report by French writer Philippe Claudel, translated from the French by American John Cullen. The winner of The Independent Foreign Fiction Prize is selected by a panel of judges comprising distinguished authors, literary critics and academics. Commenting on the judges' choice, Boyd Tonkin said: "Santiago Roncagliolo has won the Independent Foreign Fiction Prize with a novel that will grip, excite, disturb and challenge all its readers. Rooted in but not confined to the cycle of terror and counter-terror in Peru, Red April deploys with tremendous skill and cunning the arts of the political thriller in order to dramatise the struggle between love and hate, creation and destruction, in a community, a country – and in the human mind itself." Set in Peru, Red April evokes Holy Week during a cruel, bloody, and terrifying time in Peru's history, shocking for its corrosive mix of assassination, bribery, intrigue, torture and enforced disappearance – a war between grim, ideologically driven terrorism and morally bankrupt government counterinsurgency. Quietly eccentric Felix Chacaltana Saldivar is a hapless, by-the-book, unambitious prosecutor living in Ayacucho. Until now he has lived a life in which nothing exceptionally good or bad has ever happened to him. But, inexplicably, he has been put in charge of a bizarre and horrible murder investigation. As it unfolds by propulsive twists and turns, full of paradoxes and surprises, Saldivar is compelled to confront what happens to a man and society when death becomes the only certainty. 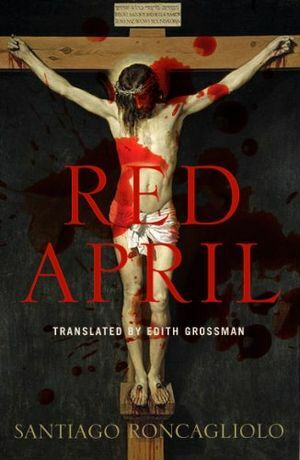 Remarkable for its self-assured and nimble clarity of style – reminiscent of classic noir fiction – the inexorable momentum of its plot, and the moral complexity of its concerns, Red April is a novel at once riveting and profound. Santiago Roncagliolo was born in Lima, Peru in 1975, and has lived in Mexico, Spain and Peru, where he worked at the Human Rights Commission. That experience led him to write the novel Red April and the non-fiction book The Fourth Sword, which is about the Shining Path terrorist group. Roncagliolo was awarded the prestigious Alfaguara Prize – awarded for an unpublished work written in Castilian – in 2006 for Red April and his books have been translated into 13 languages in more than 30 countries. He currently lives in Barcelona. Edith Grossman is the award-winning translator of such masterworks as Cervantes's Don Quixote and García Márquez's Love in the Time of Cholera. She has rendered into English more than 45 books of fiction, non-fiction, and poetry and is considered one of the most important translators of Latin American fiction in the past century. Born in Philadelphia, Pennsylvania, Grossman now lives in New York City. Antonia Byatt, Director, Literature, Arts Council England added: "Red April is a fantastic choice for this year's Independent Foreign Fiction Prize, chosen from a particularly rich shortlist. It's a huge achievement for a very talented writer and a brilliant example of how the art of translation brings the best writing to readers across the world."